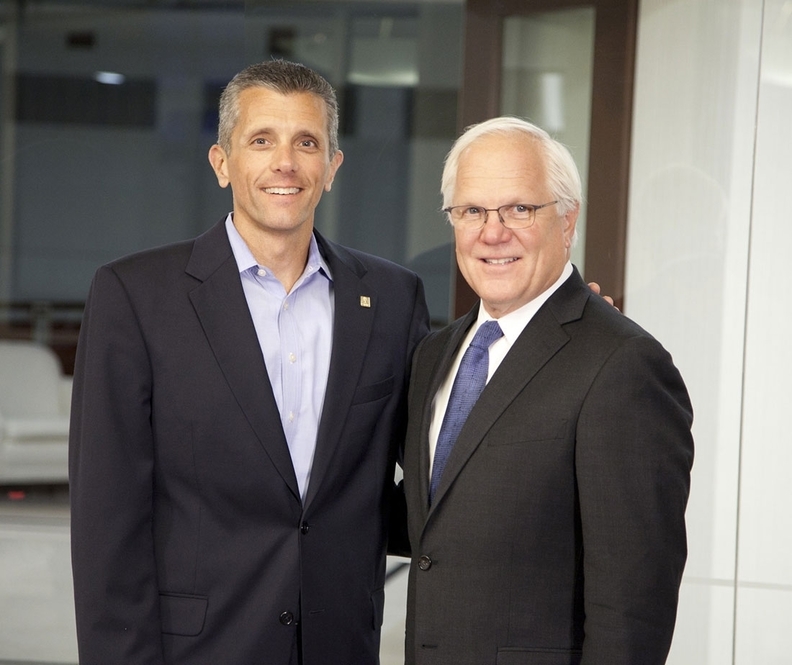 Cigna President and CEO David Cordani on the left, and Anthem's CEO Joseph Swedish on the right. Anthem said Thursday it will appeal a federal judge's decision blocking its controversial merger with rival insurer Cigna. But it's unclear if Cigna will sign on to that plan and it's likely the two former merger partners may end up in court fighting each other over the break-up fee. The U.S. District Court judge issued a preliminary injunction against the $54 billion merger between Anthem and Cigna late Wednesday, saying the deal would harm consumers. Anthem CEO Joseph Swedish said the insurer is “significantly disappointed by the decision,” which he claims will hurt Americans by limiting their access to high quality care if not overturned. Anthem said it intends to file a notice of appeal and request an expedited hearing to reverse the court's decision. Cigna, on the other hand, said it is reviewing the opinion and evaluating its options. While the 12-page order was made public, the opinion is still under seal for confidentiality purposes. Hospital and other healthcare provider industry groups said the decision is another win for healthcare consumers. The groups got their first win when the merger between Aetna and Humana was blocked by a different judge last month. “Millions of Americans have been protected from higher insurance costs, fewer choices of providers and less innovation in health care delivery,” Rick Pollack, president and CEO of the American Hospital Association, said in a statement. The AHA's general counsel Melinda Hatton said the organization would be surprised if the insurers appealed the decision. Despite Anthem's plans to appeal, observers say the decision is unlikely to be reversed. “I think it's a well-reasoned order,” said Matthew Cantor, an antitrust attorney at Constantine Cannon. While some expect the new federal administration led by President Donald Trump to be more permissive when it comes to antitrust matters, that's unlikely to help Anthem and Cigna's case. The two have presented no remedy to alleviate the effects of reduced competition, so there's nothing to be negotiated, Cantor said. In contrast, Aetna and Humana still have a shot at winning on appeal under Trump, because they offered to sell certain assets to insurer Molina Healthcare. While the judge in that case didn't find the remedy satisfactory, the Trump-led administration could negotiate further divestitures out of Aetna and Humana and agree to settle the case. Even if Anthem and Cigna decide not to appeal the decision, the litigation is unlikely to stop. Anthem will owe Cigna a $1.85 billion break-up fee, which is about $1.2 billion after tax. Though Anthem doesn't need Cigna's consent to appeal the court ruling, Anthem could argue that Cigna hasn't done enough to see the merger through and doesn't deserve the break-up payment, Cantor said. Cigna isn't about to let go of that cash easily. The two could avoid further litigation by settling, however. In fact, Jackson said Cigna officials are “actively warning against” the merger by presenting evidence and testimony that undermined the projections of future savings that would result from the combination. The two also have deep disagreements in strategy. While Anthem wants to strong-arm providers for deeper discounts, Cigna's model is based off of collaboration with providers. Anthem attempted to cast these differences as a “side issue,” according to the order. Jackson said it couldn't be ignored. Jackson also concluded that the combination of Anthem and Cigna would harm customers in the national accounts market within the 14 states where Anthem operates under the Blue Cross Blue Shield brand. There are just four insurers in the nation that are competing to provide administrative services to large, multi-state employers with more than 5,000 employees. These include UnitedHealth, Aetna, Cigna and the Blue Cross and Blue Shield Association, of which Anthem is the largest member. Under these administrative services only, or ASO, contracts, health insurers process claims, organize provider networks and handle other health plan logistics for self-funded employers. If approved, the four players in this so-called “national accounts” market would be reduced to three. Anthem and Cigna would become the largest seller of ASO services. Jackson wrote in the 12-page order that the merger would reduce competition, and will likely increase prices and stifle innovation. She disagreed with Anthem that another health insurer could step in to remedy the lost competition. Jackson also disagreed with Anthem's claim that the merger would deliver medical cost savings of more than $2 billion to customers. She questioned the combined company's ability to secure lower rates from providers. She also raised the question as to whether Anthem's use of its market power to “strong-arm” healthcare providers would lead to a lower quality of healthcare. “Anthem is asking the court to go beyond what any court has done before: to bless this merger because customers may end up paying less to healthcare providers for the services that the providers deliver even though the same customers are also likely to end up paying more for what the defendants sell,” Jackson wrote in the order. But Anthem's own internal documents show the insurer isn't planning on passing any savings along to customers, she wrote. One of Anthem's strategies is to require providers to extend Anthem's discounted fee to its health plan affiliates. “But even the Anthem executives have expressed doubts that the providers will take this lying down,” the order stated.